Looking for a budget starter racing package featuring steering wheel and pedals for your virtual vehicle? This is it! 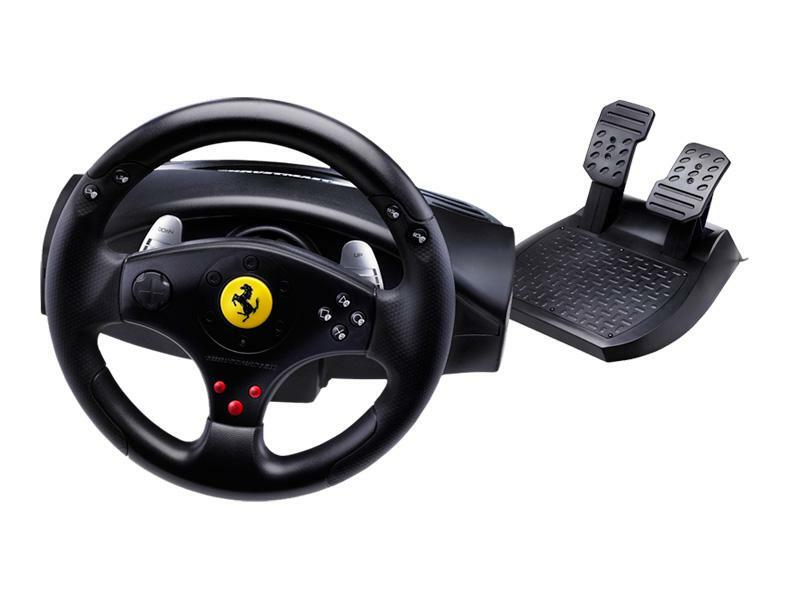 The Thrustmaster Ferrari GT Experience Racing Wheel and Pedal set provides simple USB connection to both PC and PS3 and most all car and vehicle racing games and simulators will work with it. A decent set that will suit your needs until you feel you might need something with more features to take you to the next level! A wheel built on the values of Ferrari: passion, performance, innovation & quality! 2 wheel-mounted levers for Ferrari-style sequential gearshift management - change gears without taking your hands off the wheel. This allows you to keep full control of your vehicle at all times! Mapping feature: all buttons, directional buttons, levers and pedals are fully programmable for versatility acorss and within your racing simulator titles. Genuine rubber with Ferrari-style texture on grips - non-slip surfaces, even when the action gets hot and heavy! Extra-wide, long-range progressive pedal assembly with resilient brake pedal and "Home" button for Playstation 3. Unit is compatible with both PC systems and PS3.